HA NOI (VNS) — The 26th round of the 2015 V. League 1 tomorrow will determine if Can Tho or Dong Nai are relegated to the first division event. Dong Nai need to beat Quang Ninh Coal and see Can Tho lose to Quang Nam in order to avoid relegation. "Quang Ninh are sure to escape relegation, and we are determined to have a win at the last match," said Pham Thanh Hung, Quang Ninh FC chairman. Dong Nai currently sit at the bottom of the ladder with 21 points, while Can Tho are second from last with 24 points after 25 matches. Quang Ninh lost to Dong Nai 3-4 in the 2014 tournament's disreputable match. Six Dong Nai players were found guilty of fixing the match. They were banned for life by the Viet Nam Football Federation. "Quang Ninh Coal will play fair with Dong Nai in the last V. League match for the fans," said Quang Ninh coach Pham Nhu Thuan. Meanwhile, Can Tho will say goodbye to coach Vu Quang Bao whether or not they avoid relegation. The team don't care the result of the match between Dong Nai and Quang Ninh. They will be awarded VND2.5 billion (US$113,600) for a draw with their rival Quang Nam to stay at the event. However, the match will be tough for Can Tho, as Quang Nam are in good form. They beat Thanh Hoa and champions Binh Duong in recent matches. In other news, Binh Duong will face Dong Thap, Dong Tam Long An will face Ha Noi T&T and Hai Phong will play Song Lam Nghe An. Elsewhere, Khanh Hoa will face Hoang Anh Gia Lai and Da Nang will meet Thanh Hoa. 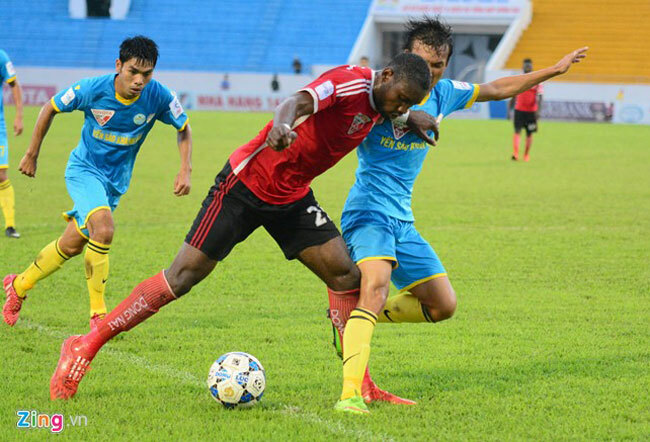 Binh Duong became champions of V. League 1 with two matches in hand after a goalless draw with Hai Phong in the 24th round at Lach Tray Stadium on September 1. The champions now have 49 points after 25 matches, six points more than their closest rivals, Ha Noi T&T and Thanh Hoa. Binh Duong, the first Vietnamese team to win the national premier league, did so for the fourth time. Their previous titles were in 2007, 2008 and 2014.